I just went to the Mecum Auction in Indy last night. That is awesome. There are supposed to be 2,000 cars there for sale. Here are just a few of the 71-73 Mustangs that I saw there. The Yellow 73 convertible is pretty cool. It has a 4 speed. The 3 71s that are together and in the corner of the main arena are beautiful. I had to hurry to get through all the areas where the cars were in one evening. We sat in the auction for a while and a nice 71 Mustang coupe went through that got a bid over 14K and did not reach it's reserve. 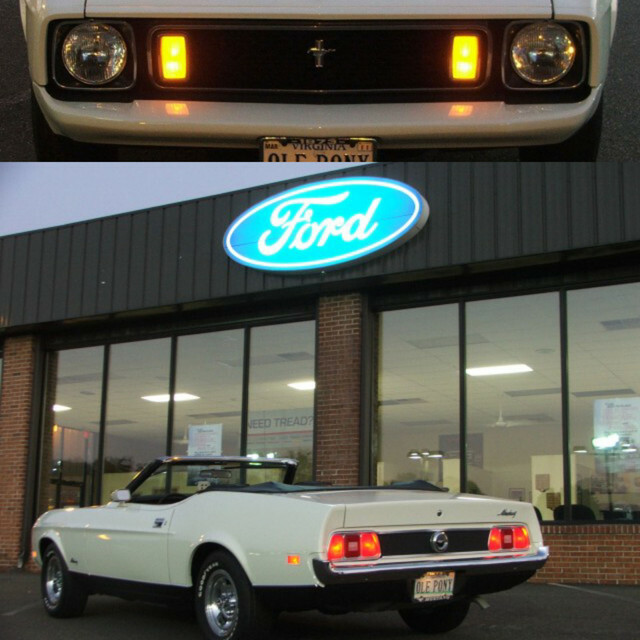 It had a mach 1 grille, bumper and hood as well as Magnum 500s. I seen the blue coupe go across the stage and not sell but only watched about ten minutes of it. Thanks for the pictures. Pretty sharp looking Stangs! I watched on it on HD Theater for a while but did not see any of these go across the block. I did see some good deals like the low milage early 90's Vette for under $10K. OLE PONY;23834 Wrote: Thanks for the pictures. Pretty sharp looking Stangs! I watched on it on HD Theater for a while but did not see any of these go across the block. I did see some good deals like the low milage early 90's Vette for under $10K. The white Boss 351 went across this evening, but my brother was here and we were not paying a lot of attention to what was going on. I have it on my DVR though. I think it got a high bid in the 40s and did not meet reserve. The 3 71s that are together will probably be high dollar cars as they have a lot of documentation and are in the corner of the main building where the auction arena is. The best cars are usually in that building. The 15X7 dog dish wheels were standard on boss 351 cars. They were only made in 15X7 inch width's not 7.5 inch I hope this helps.